Ratha-Yatra Festival is Coming! 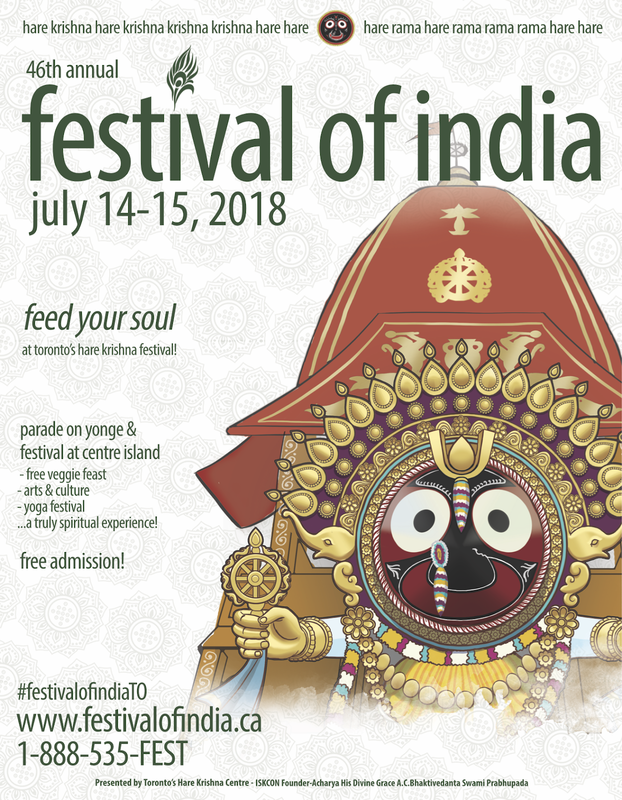 July 14-15, 2018 ~ The Toronto Hare Krishna Temple! We would like to humbly invite everyone to join us this year, on July 14th-15th, 2018 for our 46th Annual Ratha-Yatra here in Toronto. Festivities will kick off on Friday, July 13th as we celebrate the Festival of the Golden Moon, a 12-Hour Kirtan, featuring many kirtaneers from around the world! We will be blowing the roof off New Remuna Dhama (ISKCON Toronto) with this 12-hour kirtan marathon. Once again, the special event is planned for Friday, July 13th from 10:00am to 10:00pm. This kirtan event is not to be missed! Immediately following the parade, festival-goers enjoy a kirtan-filled ferry ride over to Centre Island, where celebrations continue for the rest of the weekend. While on Centre Island devotees will be able to enjoy the association of a number of distinguished personalities! The Centre Island festival-pavilion will also host a children’s area featuring fun and wholesome, Vedic-themed activities and events. 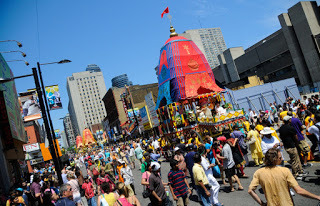 All in all, Toronto's Ratha-Yatra will offer everyone a chance to experience a unique festival promoting simple-living and high-thinking, with kirtan on the streets, underground, and on the water! Rathakrishnan from Lisgar drive. Thanks for your kind information. I m girish from india.looking job in Canada I m diploma one year fashion designer. I looking any job in Canada. Sir I am from India. I am retired person. Now I want to join iskon Toronto Canada. I have 34 year experience in administration field. U can use my experience. I want to join rath Yatra in July 2018.pl advice me.